Nova Gorica (pronounced [ˈnɔ̀ːʋa ɡɔˈɾìːt͡sa] ( listen); population: 13,852 (town); 21,082 (incl. 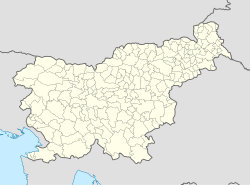 suburbs); 31,000 (municipality)) is a toun an the centre o the Ceety Municipalities o Nova Gorica in wastren Slovenie, on the border wi Italy. ↑ "Statistical Office of the Republic of Slovenia - Census 2002". Retrieved 12 August 2016. Wikimedia Commons haes media relatit tae Nova Gorica. This page wis last eeditit on 11 Mairch 2018, at 18:43.